2 Timothy 1-6 "You then, my son, be strong in the grace that is in Christ Jesus. And the things you have heard me say in the presence of many witnesses entrust to reliable men who will also be qualified to teach others. Endure hardship with us like a good soldier of Christ Jesus. No one serving as a soldier gets involved in civilian affairs--he wants to please his commanding officer. Similarly, if anyone competes as an athlete, he does not receive the victor's crown unless he competes according to the rules. The hardworking farmer should be the first to receive a share of the crops." There's great reward for running the race well! Timothy had all the right training... from his Mother and Grandmother and Paul himself... but ultimately, he had to put that training to work, help train others to also teach, and remember who it was he really was working for! Paul often used the phrase "run the race well" when referring to his job as God's servant. As we approach Father's Day, let's remember to thank and appreciate the men in our lives who are Dads. Lets especially appreciate all those who lead by Godly example, who don't compromise their faith, and are running the race well. Lisa's challenge to us this week is to make a Father's Day card or a Masculine card. I used the MMSC57 for my layout, and one of the free digi's over at Priscilla's new NING community "Crafter's Digital Art Center". They have a month long kick off challenge... anything goes! Several companies have chipped in free digis to get the group started! I chose this cabin in the woods image by Robyn's Fetish Digital Stamps. I'm really new to digis... have only used I think 2 before, but I decided to give it a try. I loved this image and thought it would be perfect for a masculine card! I printed it on my Laser printer and then colored with Copics. I doodled in a little detail to give the bushes in the foreground a little dimension. I sponged over the whole thing with T Holtz distress ink to take the "whiteness" down. The frame is from Nellies Multi Frames from Terryfic Times. I used the simpler of the two options for the sketch, since this is a guy card. My only embellishments are the three little screw brads in two corners. The image panel is popped up and the wood dp is embossed with the CB Distressed Stripes EF. I added the MS trees punch double punched at the top and the sentiment is from Our Daily Bread designs set called "Dad". I used a SB label 8 for that. We'd love to have you play along... if you do, please place a link to the Stampin Sisters in Christ Blog in your post, and place a direct link to your project on the SSCC thread. Be sure to check out the rest of the Design Team for more inspiration for this week's challenge! Here's links to the rest of the team to make it easier for you! Thanks to our sponsor this week, Simon Says Stamp. They are donating a cute birthday cake set which you can see on the Stampin sisters in Christ Challenge. Thanks for looking and I so appreciate your sweet comments! Have a blessed week! Oh my this is fabulous, a little work of art... great job. Thanks for playing along with Cards for men this week and good luck in the challenge. This is fabulous!! Love the image and what wonderful coloring. Love the embossed back ground and that awesome tree punch. Great card. WOnderful imaga and papers. WOW!! Grace, this card is gorgeous. Beautifully done and colored to perfection. What a wonderful entry and Great take on the sketch too. You amaze me week after week :) So happy you are enjoying the new site. Thank you so much for playing the Midnight Madness sketch challenges. OMG, Grace, you've done it again - another MASTERPIECE!! This has to be one of my all time fave masculine cards!! WOW, look at those wonderful details, punches, embossing, coloring - I LOVE IT!! Thanks SO MUCH for playing the Midnight Madness Sketch Challenge this week and I really hope you can join in again next week!! Grace, this is amazing! The trees at the top are so cool. Your digi turned out just right. Way to go! So beautiful card Grace,so wonderful image,i love the colours. Grace, I absolutely adore this. When I first saw that digi, my heart stopped. It was like looking at the log home my husband and I built that we had to leave behind in Connecticut when we moved here. It was my dream home and I only got to live in it for 1 year. You have done this image beautifully. It is simply sensational and brought back memories of the biggest craft project I ever tackled in my life!!! lol Great job with the sketch this week. Thank you for playing along with us ad the Midnight Madness Sketch Challenge. Oh, I love this, Grace!! 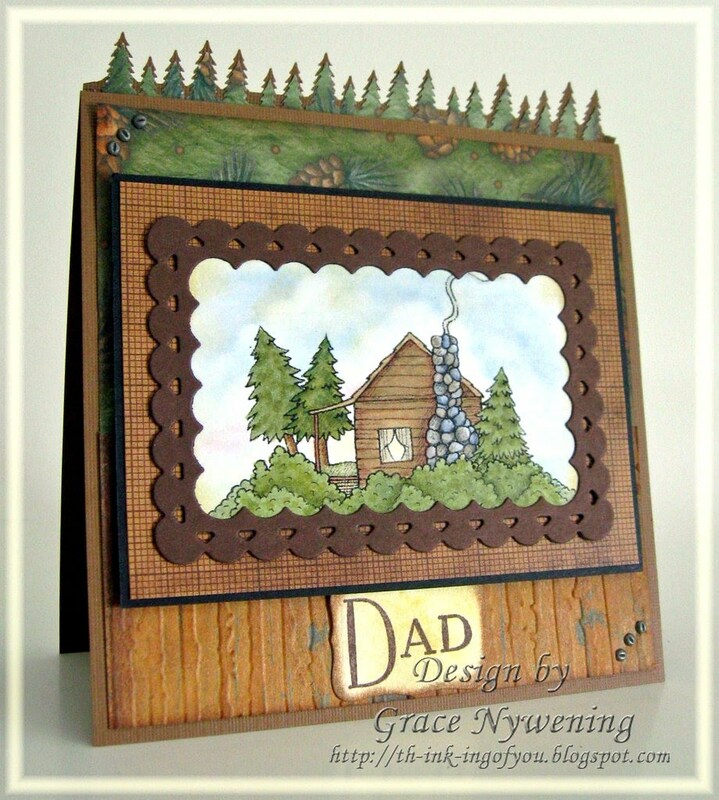 What a beautiful mountain home scene and coordinated so well with your paper and punches and brads...wonderful!! I think we who have men that live Godly lives with integrity are so blessed...and wow on your husband's Dad being 96!! Wow Grace, this is a fabulous card. Every little detail and element just fits together perfectly! This is gorgeous Grace!! I just love your take on the sketch, the texture, the coloring, and the design!! Gorgeous masculine card my friend!! OMG Grace this is one unbelievable Man Card...I LOVE LOVE the scene you created with the frame and the tree border, that is just tooo AWESOME!!! Gorgeous work sweetie!!!! Way to go Grace on the digi... I LOVE this image. Your card has such a rustic feel. This reminds me of my dad's cabin..Love the pine tree border too.. Looks great.. WOW!! You did an absolutely amazing job with this image. Beautiful! Thanks so much for playing with us at Daisy Doodles. Gorgeous card for a golfing guy! thank you so much for joining the challenge at Daisy Doodles. Your coloring is amazing. Grace, once again you have made a masterpiece! I would love to live in that cabin in the woods. Better yet it could be a crafters hide away...all we need is someone to feed and clean up after us and we would be all set! Have a great week! Ohhhh check out all of these challenges. FABULOUS Rustic card! Love the tree border! Wonderful unusual male card! This is not just a card, this is art! Love scenery card. Great card for a guy. Just love your image. Thanks for playing with us at Cards for Men. Good luck on the Challenge. Fabulous card, really very clever. What a great card, thank you for joining us at CRAFT Challenge. This has to be one of the best cards I've seen. I absolutely love it. Thanks so much for joining us over at Cards for men and good luck with the challenge. This is a simply wonderful card Grace! Thanks so much for joining in with our Xtra Special challenge at MTTC! Thank You: a Sneak Peek and a Challenge! MMSC59 and a Sneak Peek! Layers of Color Summer Release Sneak Peek!